But, invariably, placing two experiences close together will show more clearly the pleasant and less desirable in each. We had arrived before lunch, and were told we would not be allowed to enter until after the meal had been served, promises on our part to refrain from pilfering bites from the buffet notwithstanding. When I came to the Club Med part of the story, they laughed, sounding relieved, and told me that they would much prefer the latter to the former. Some of my favorite travel adventures have been where very different experiences were juxtaposed in a short period of time, especially on the same trip. Sometimes, the contrasts are not huge, but rather a mild curiosity. At other times, experiences we thought would be similar were instead nearly opposite. Once in a while, the highlight of a trip turns out to be the smaller part, and the anticipated highlight a disappointment. But, invariably, placing two experiences close together will show more clearly the pleasant and less desirable in each. One trip to Mexico, in particular, showed these contrasts. 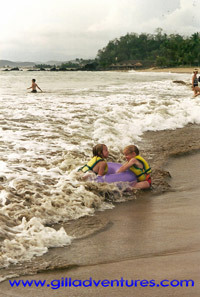 The approaching 50th anniversary of John’s parents led them to invite their children with spouses, and the grandchildren to join them for a week at a Club Med in Ixtapa, Mexico. Naturally, we were all eager to spend a week in the sun, thawing our bodies in the tropics after a long winter. Taking full advantage of the gift of paid airfare, we added on a few days to before this family reunion to visit a small fishing village John’s sister Carey had heard of from friends. After a cancelled flight, causing an unexpected night spent in Portland and arrival not with Carey who had complete information about where we were staying, struggling through sorting out where we were headed with a cab driver and the dispatcher in the airport after I realized that all of the information I had printed off about our trip was still in the printer tray at home rather than in my bag, we found ourselves in a taxi, on a dirt road, waiting for the third pig to get out of the way. Our path to Barra de Potosi wound through old coconut plantations, and past little rural Mexican homes with said pigs, chickens, and small bare-bottomed children in the yards. In Barra de Potosi, there was one small hotel, a half dozen or so homes were the entry or living room had been converted into very small mini-markets, and a lovely guest house called Casa del Encanto. Late in the day, the beach was lined with fishing boats, whose owners sat on the front steps of their homes in the evenings mending their nets. The dirt streets were raked and made tidy for the bare feet of the village children to play in them as the days draw to an end. The lagoon and beach had a small handful of restaurants, and the owner of Casa del Encanto, Laura, shared with us the invaluable information as to which of these used bottled water, and which were a probable health risk to us gringos. One of the restaurants also had a waiter whose limited English was a good supplement to our lame Spanish, and we were able to enjoy some very good meals with our toes in the sand, watching the waves. I was alarmed when my little kids first came running to me with some candy that had been handed through the openings in the block walls of the Casa. They were from the children playing in the street, and putting something given to them by strangers into their mouths was highly disturbing to me. Laura saw my worry and explained that she knew these local children, and that it was innocent and not malicious in any way; they had seen the little blondes, and were welcoming them. My girls and their cousins made their way out into the street and in spite of the language gap, played several games and learned some complicated hand clapping thing that I was never able to get the hang of. There was no shopping to speak of, other than the funny little mini markets selling beer and chicklets and one or two ladies plying their necklaces and bracelets on the beach. Laura did have a friend whose family made hammocks, however, and offered to have them bring a few over for us to see. They were far nicer than most we’ve seen anywhere else in Mexico, and we brought one home that hangs in our front yard to this day. It has held up beautifully to everything except dog teeth. 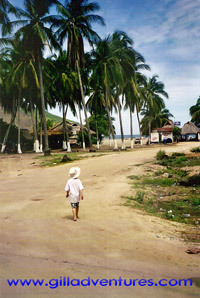 When it was time to leave this paradise and head to our family reunion, we loaded up into the Barra de Potosi taxi fleet, which consisted of one small car and a small truck with a covered back end and benches built in, and headed to Club Med. At the gate, we were regarded suspiciously, arriving in transportation unknown to them. I had to fish through my bags and find our confirmation sheets to be let through. When the cab drivers left us, we said goodbye to the last of the warm, welcoming, lovely people of Barra de Potosi and became numbers. We had arrived before lunch, and were told we would not be allowed to enter until after the meal had been served, promises on our part to refrain from pilfering bites from the buffet notwithstanding. With no transportation, our choices were to sit in the lobby, or walk back through the gate and down the street to the crocodile park. One of my children had sore feet, and did not make it to the park, but I understand that her sister, father, and cousins watched a one of the large reptiles eat a turtle. Had the front desk people at Club Med been somehow able to look up our reservation information, they would have found that we had, in fact, arrived a day late, and had paid for not only the lunch they were protecting from us, but also the prior dinner, breakfast, and night’s lodging, as well. Now, mind you, the staff at Club Med were, overall, pleasant and responded to our requests with courtesy. But there is not one of them I can remember specifically, who made any sort of impression on me that I might be able to picture them. Our children would only agree to go in the youth program because their cousins who were also there, and they asked every day if they could stay with us instead. It was nice as a parent, however, to relax and do things other than the choices of those under ten. But, somehow, it felt like we could have been anywhere. What’s the point of going to Mexico if you are there surrounded by other gringos speaking mostly English, with a little German and French mixed in, and very little Spanish? When I carefully construct a Spanish sentence asking where I might find the cream for my coffee and am answered only in English, I get a little disappointed. They also seemed to have two classes of workers. The ones who cleaned our rooms and poured our coffee were not allowed in the bar or social areas with the guests, only the recreation leaders and a few others, mostly international students. It was the Mexico experience sanitized of Mexicans. After the first couple of days, we came to refer to the place as Club Medio, as in middle or average. The food was pretty good, although it is hard to deliver exceptional food on a huge buffet. The recreation equipment was somewhat limited, the little sailboat was a dog and we could not take it outside a small area close to the beach. There were also some formed plastic sea kayaks, which we took out a few times. The room was adequate, if a little stark. On the positive side, it did offer us a place to gather when we wanted, spending time with family, and the flexibility to make our own schedule, if we preferred. Nobody had to coordinate the schedules, cook, or even figure out meals. 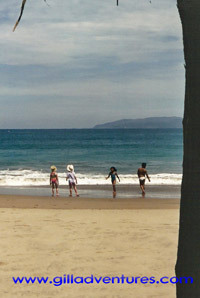 It also lacked the sand fleas that were a bother and the downside of our experience at Barra de Potosi. Obviously, based on the numbers of people in each place, there is a huge market for the sanitized experience. Not long after we returned home, I ran into a couple whose daughter was in Hannah’s class at the time, and I told them about our trip. I pointed out the extremes of the experience, starting with Barre de Potosi. When I came to the Club Med part of the story, they laughed, sounding relieved, and told me that they would much prefer the latter to the former. For myself, I will choose the road less traveled, and happily wait for the wandering pigs to get out of the road.